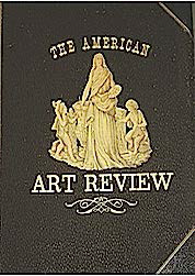 The American Art Review was founded and edited by Sylvester Rosa Koehler (1837-1900). Born in Leipzig, Germany, he emigrated with his family to the USA in 1849. He subsequently became Technical Manager of the lithograph publisher Louis Prang and Company, and the first curator of prints at the Museum of Fine Arts in Boston. In his introduction to volume 1 of The American Art Review (1879), Koehler proclaimed that his aim in establishing the journal was to create a periodical that would “occupy a position analogous to that held by the ‘celebrated’ European publications Gazette des Beaux Arts, L’Art, the Portfolio, and the Zeitschrift für bildende Kunst. Although The American Art Review was to survive for only two years, largely as a result of its lavish production costs, it is generally acknowledged today as a primary catalyst in fostering the art of etching in America. Notable among the artists who were commissioned to produce original etchings for the journal were Otto Bacher, J.M. Falconer Thomas and Peter Moran, Henry Farrer, Samuel Coleman, Anna Lea Merritt, Robert Swain Gifford, Alfred Brennan, James D. Smillie, John Foxcroft Cole, and Marcel Gaugengigl. Significant among the articles published by The American Art Review were ‘A History of Wood-Engraving in America’ by W.J. Linton; and ‘American Stained Glass’ by R. Riordan.